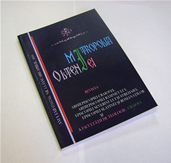 With a tradition of over six decades (since 1950), the journal ‘Mitropolia Olteniei’ aims to develop and promote the Romanian academic theology. Diversity and accuracy of published materials (studies, articles, sermons, translations, reviews, etc.) crossing all areas of our theology, come to support theology research. The journal also brings its contribution to the development of inter-religious and inter-cultural dialogue and maintains a permanent collaboration with emeritus professors of the prestigious universities abroad (France, Germany, USA, Italy, Switzerland, England, Greece, Belgium, Croatia, Poland etc.). Currently, the publication, in a beautiful graphic presentation, appears with the blessing and support of His Eminence Dr. Irineu, Archbishop of Craiova and Metropolitan of Oltenia.